Free Theology eBooks on the Web. These websites offer theological E-books for free. Most of the books are not subject to copyright laws. books in electronic format, selected for your edification. There is enough good reading material here to last you a lifetime. Gives access to important primary source documents. The writings of the church fathers, Thomas Aquinas' "Summa Theologica" and other important works are available here. Provides access to works which are no longer under copyright protection. Kellar Library Catalog: These titles have a call number beginning with EB or EBKL. 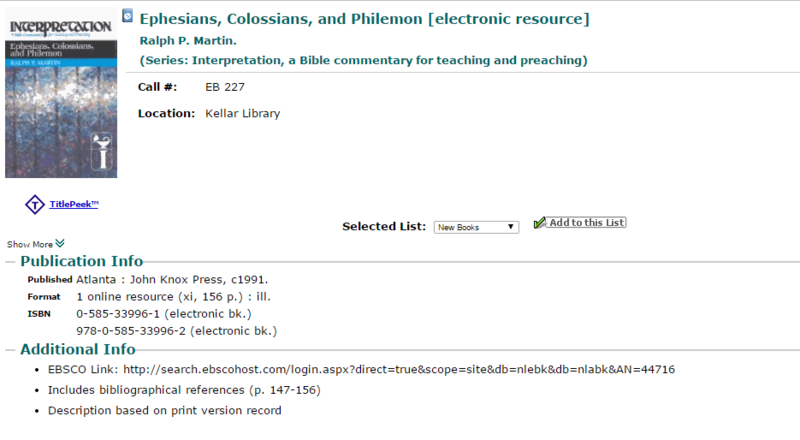 Within each of these records is a link to the book in the EBSCO database. When using the Kellar Library catalog on the Web, you can click this link and go straight to the EBSCO page, provided you are either on campus, or logged in. EBSCO eBooks: You must use the same login information for the eBook database as for EBSCO databases. If you are a student, you can acquire these login credentials by calling the Library or via email. You can read the eBook within EBSCO in your browser. The eBooks in this collection can either be viewed online or downloaded to your computer or mobile device for offline use. For instructions on how to download E-books to your device, look below. In order to download eBooks to your computer or your Apple and Android devices, you will need an Adobe Digital Editions account. Authorize your computer to view material associated with your ID. Download books directly from the Ebsco E-books database. Download the Ebsco eBooks App for your device (IOS or Android). Input your Adobe ID username and password. Authorize your device to view material associated with your ID. You can select books on the Ebsco ebooks database site or find them within the app. To find them within the app you must select your country, state, and BMA Theological Seminary Library. To find them within the app or online you must login to your Ebsco account. (Note: Your Ebsco account is not the same as the authorization username and password for BMATS students on Ebsco, it is an account with a password that you set up).